Leaves are deformed, tattered and chlorotic. Photo by Ron Cameron, 1976. Typical light and dark green areas on the leaf. OSU Plant Clinic collection, 2012. Cause The Cherry mottle leaf virus is transmitted by budding, grafting, and has been experimentally transmitted by a microscopic eriophyid mite, Eriophyes inaequalis. The native bitter cherry, Prunus emarginata, is considered the mite's principal host and is a symptomless natural host of cherry mottle leaf. 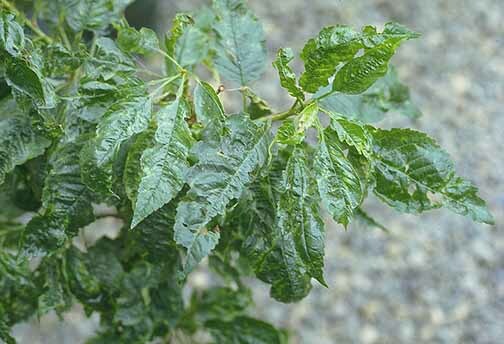 The disease occurs in a few orchards in all cherry-growing areas of Oregon and Washington, some of which have become infected through planting noncertified, symptomless cultivars. 'Rainer' is a carrier but does not show symptoms while 'Bing', 'Celeste', 'Corum', 'Lapins', and 'Sweetheart' can all show severe symptoms. Flowering cherry, peach and apricot are also hosts. Symptoms A mottle-leaf pattern is the principal symptom, being most severe on 'Bing', 'Royal Ann', and 'Lambert'. Mottling is irregular and chlorotic, causing a leaf distortion early in the season; leaves pucker increasingly as the season advances. Leaves are smaller and may develop shotholes but do not fall. When severe, as in the case of 'Bing', fruits are abnormally small, lack flavor, and ripen later than normal. Tree growth is retarded, and shoots develop a rosette appearance. Less susceptible cultivars have the same general symptoms but are less severe. Sampling Serological assays are available for leaves, flowers, and fruit but will not work on dormant wood. Reverse transcription polymerase chain reaction is necessary for detection in dormant wood. Bing is a good indicator host. Plant virus-indexed (and found to be free of all known viruses) trees. Remove trees showing severe symptoms. They will never be profitable. Remove wild cherry trees from around the orchard. References Hadidi, A., Barba, M., Candresse, T. and Jelkmann, W. 2011. Virus and Virus-like Diseases of Pome and Stone Fruits. St. Paul, MN: APS Press. James, D. and Mukerji, S. 1993. Mechanical transmission, identification, and characterization of virus associated with mottle leaf in cherry. Plant Disease 77:271-275.